Choosing the best baby high chair isn’t just a case of seeing what’s on offer at Amazon or Mamas and Papas. There’s a huge range of designs out there at all kinds of prices, and it can feel like a bit of a minefield. 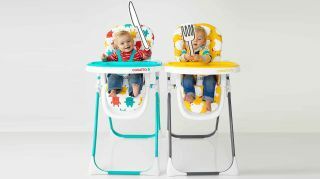 So how do you choose the best baby high chair? Cheap high chairs may be false economy: spending a bit more on something that can adapt to your child’s development is often a better investment than a procession of cheap plastic chairs. Safety is the biggie, and all UK high chairs have to pass strict safety standards. But children don’t, and they can be surprisingly good at wiggling out of straps or seatbelts. If baby likes to rock or wriggle it’s worth looking for something sturdy that won’t topple, and it’s also worth remembering that many removable components such as chairs can be removed and hurled by children too. High chairs for younger children tend to be padded, which is good and bad: it’s comfy for your child but can be a nightmare to clean. Washable fabrics are a must: we’ve been known to get the pressure washer out to remove some of the more stubborn things our children managed to get into the creases of highchair padding. You know what you’re getting with Mamas & Papas: good design, good build quality and a price that’s maybe a little higher than other less aspirational options. The Bop sits towards the bottom of its extensive range, but it’s a great all-rounder: modern design, an easy to clean seat, removable tray and the option to convert it to a lower chair and/or junior dining chair. It’s perhaps a little bland compared to some of the brighter options around and the seat height isn’t as adjustable as some, but if you’re looking for a straightforward and solid high chair that’s really easy to clean - and no matter what chair you get, you’ll be cleaning it a lot - then the Bop is an excellent option. Sprout! Sprout! Let it all out! This is a chair you can’t do without! Most high chairs have to be given up at around the three year mark, but not the Tot Sprout: this award-winning high chair has three levels of seat adjustment plus depth adjustment and footrest adjustment that should keep it usable until your child is around five years old. Clever touches about: a recess in the tray that can hold 200ml of accidentally or deliberately spilled liquid; removable cushions for easy cleaning; a five-point harness for safety; and an extra cushion for when you convert the Sprout from high chair to day chair. It’s a bit more expensive than other options but it’ll last twice as long, and we think it’s a good-looking bit of furniture too. We hope you like pink, because if you don’t the Supa Noodle is £20 more expensive. It’s suitable for six months to around three years, it can stand up when folded and the trays are removable with one hand - useful if you’re trying to do the usual million things at once. The seat has six different height positions, three reclining positions, an adjustable footrest and a five point harness so baby should be both comfortable and secure no matter how much of a would-be escapologist they are. It’s won a ton of awards with good reason: it’s cleverly designed, very flexible and while it’s a bit bulky-looking it’s easy to stow away when it’s not required. In an ideal world every restaurant or cafe would have more than enough high chairs, and those high chairs would be in great condition and spotlessly clean. And in the real world there are usually too few chairs available, or the few chairs that are available look like germ factories. Enter the Munchkin, a bag that you can use to carry baby essentials and that transforms into a booster seat whenever you need it. It’s strong, its no-slip pads are a boon on glossy seats and it’s fairly easy to clean, but it’s for occasional rather than everyday use and the lower age limit is around 12 months rather than the usual six. It’s a brilliant thing to keep in the car for last-minute cafe trips or sneaky fast food adventures. Sometimes it’s useful to have a straightforward and easy to clean high chair that can go anywhere: to visit the grandparents, to take on holiday, to take camping or to feed your child at a friend’s house. The Pocket Snack is ideal for that kind of usage, although while the lack of padded cushions means it’s eminently washable - just stick it in the shower - it’s also less comfortable than larger options, so it’s best for occasional use rather than everyday use. It’s adjustable to three different heights and is designed to be secured to a chair, and once you get the hang of its straps it’s solid and safe on pretty much any kind of chair.